Bombay Sapphire has taken over the roof of Harvey Nichols' Knightsbridge store, by creating a gin and tonic-themed oasis. The space opened yesterday (13 April), and visitors to the fifth floor terrace will be able to create a bespoke Bombay Sapphire tipple that's tailored to their tastebuds until 11 July. The bar, which is open from 11am till 11pm, is stocking an unusual selection of ingredients. Besides elderflower, yuzu and lemongrass tonics, guests can also create their own mixers by combining tonic syrups from Jack Rudy with soda water. For those wanting an expert opinion, Bombay Sapphire is also serving a menu of 'ultimate' gin and tonic twists, designed by brand ambassador Renaud de Bosredon. These drinks are inspired by the gin brand's 10 botanical ingredients, and include goji berry liqueur and passion fruit. Bosredon is also set to host two masterclasses at the venue next month. These will see guests rummage around the store’s food hall for additions to their drink such as fruits, herbs and bitters. Tickets for the masterclass cost £35 per head and include two gin and tonics. 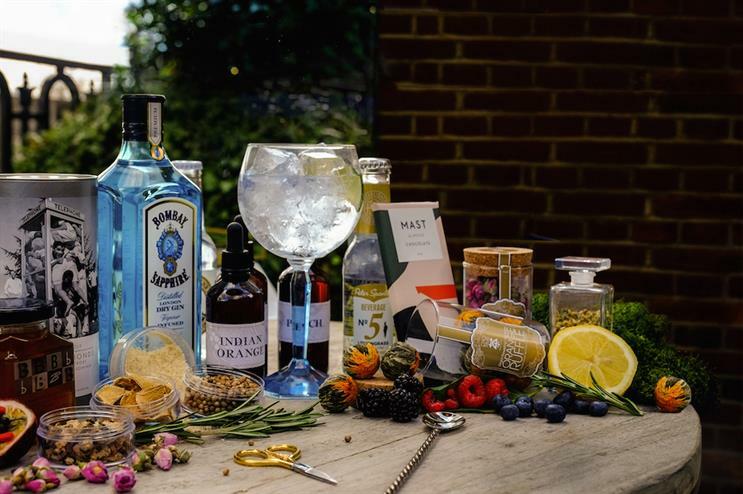 Bosredon, speaking on behalf of Bombay Sapphire, said: ‘We are delighted to be partnering with Harvey Nichols to launch 'The Rooftop Retreat’, a celebration of the iconic gin & tonic. "We have worked closely with Harvey Nichols bar team to develop a series of masterclasses and an exclusive menu that encourages guests to discover their bespoke gin & tonic serve using a range of unusual ingredients picked from the Harvey Nichols Foodmarket." Back in November, the brand ran a series of workshops inside a glass Wardian case to shine the spotlight on its botantical ingredients.